"I think it's the most beautiful tool of the world and it allows us the most magic thing..."
The bell rings, and the halls of Institut St-Joseph in Quebec City echo the clatter of the fifth- and sixth-graders. Some take their chairs in the more traditional classroom on the lower floor. Others attend to their projects in the large, open activity room upstairs, pausing perhaps to study one of the chess games hanging on the wall before meeting in groups to plan the current project. A third group steps up a half flight of stairs into the small narrow room at the front of the building, one wall lined with pictures and plastercine models of imagined aliens, the other with a bank of Apple computers. This last group of students, eight or so at a time, fire up their browsers and log into their cyberportfolios, a publication space that Principal Mario Asselin calls a "virtual extension of the classroom. "1 This virtual space is composed of three sets of weblogs, or blogs: a classroom Web space, where announcements are displayed and work of common interested is posted; a public, personal communication zone, where students post the results of their work or reflection; and a private personal space, reserved for students' thoughts and teacher guidance. The students at St-Joseph are reflective of a trend that is sweeping the world of online learning: the use of weblogs to support learning. And even though the world of fifth grade may seem remote to educators in the college and university system, these students, when they enter postsecondary education, may have had more experience writing online for an audience than writing with a pen and paper for a teacher. Such students will bring with them a new set of skills and attitudes. Institut St-Joseph is an unassuming, yellow-brick school on a tree-lined road in the west side of Quebec City. The students inside may be early adopters, but they are far from alone in their use of blogs. The phenomenon known as blogging, or weblogging, is sweeping the Internet. A February 2004 report published by the Pew Internet & American Life Project noted that at least 3 million Americans have created blogs, with similar numbers being seen worldwide.5 And schools have not been immune from this trend. While nobody can say for sure just how many students are blogging, inside the classroom or out, it seems clear that their numbers are equally impressive. And the number of educational bloggers is growing daily. The Educational Bloggers Network, sponsored by the Bay Area Writing Project and Weblogger.com, is a community of some 120 teachers and educators involved in blogging. The following announcement on the site, by San Diego State University's Bernie Dodge, is typical: "It's that time of semester again. Tonight I introduced blogging to my class of pre-service English and foreign language teachers." The result: twenty-eight new student blogs.7 This same pattern is being repeated in schools and universities across the United States and around the world. In my own case, blogging evolved from three major directions. 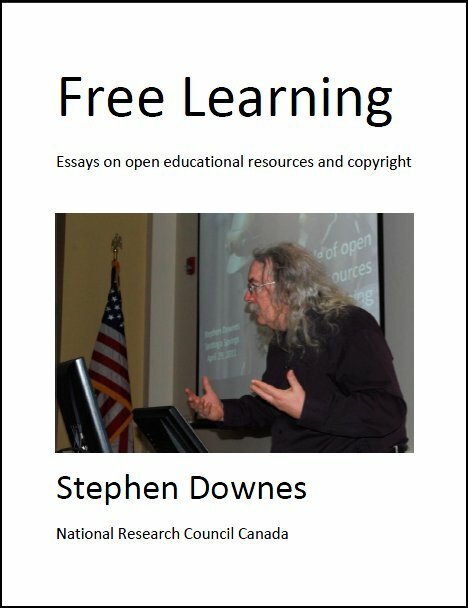 First, the blog that began as Stephen's Web (http://www.downes.ca) and that eventually became OLDaily originated as a better means for me to store bookmarks. Second, the blog that became NewsTrolls originated as a series of posts by Pasty Drone. Called Media Rant News Trolls, these were posted on the old Hotwired Threads. When eight of us, including Pasty and myself decided to leave the site in 1998, we adopted Pasty's format and name. And third, when I created The Brandon Pages site, about the city of Brandon, I created a blogging tool to announce new links and events. Today, the weblog is frequently characterized (and criticized) as (only) a set of personal comments and observations. A look at the history of weblogging shows that this isn't the case. As Rebecca Blood observes: "The original weblogs were link-driven sites. Each was a mixture in unique proportions of links, commentary, and personal thoughts and essays." Bookmarks, rants and raves, news, events: all were fodder for the weblogger. Weblogs (so named in 1997 by Jorn Barger in his Robot Wisdom Web site) began to be recognized as such in 1999 when Jesse James Garrett, the editor of infosift, began compiling a list of "other sites like his." Garrett sent this list to CamWorld's Cameron Barrett, who published it on his site. Soon after, Brigitte Eaton compiled a list of every weblog she knew about, creating the Eatonweb Portal.8 There is no doubt that these early lists were incomplete; weblogging was springing up around the Web more quickly than anyone realized. I myself spent the two days following 9-11 updating NewsTrolls. Although we had covered and commented on the tech boom, world events, and a presidential election, the events of September 11 brought home to me the immediacy of blogging. We ran ongoing coverage, submitted via SMS to my e-mail, as one of our own made her way from the dust and debris of New York's financial district to her home on the west side. Blogging not only allowed us access to the event; it made us part of the event. And with that, the form had indeed finally come into its own. But this definition-which tries to characterize the blog by what it contains-seems to miss the point. Commenting on Seipp's statement, Meg Hourihan takes a different approach: "Whether you're a warblogger who works by day as a professional journalist or you're a teenage high school student worried about your final exams, you do the same thing: you use your blog to link to your friends and rivals and comment on what they're doing. Blog posts are short, informal, sometimes controversial, and sometimes deeply personal, no matter what topic they approach. "13 The definitions of blogging offered by bloggers, as opposed to those offered by external commentators, follow this theme. Blogging is something defined by format and process, not by content. A blog, therefore, is and has always been more than the online equivalent of a personal journal. Though consisting of regular (and often dated) updates, the blog adds to the form of the diary by incorporating the best features of hypertext: the capacity to link to new and useful resources. But a blog is also characterized by its reflection of a personal style, and this style may be reflected in either the writing or the selection of links passed along to readers. Blogs are, in their purest form, the core of what has come to be called personal publishing. First, teachers use blogs to replace the standard class Web page. Instructors post class times and rules, assignment notifications, suggested readings, and exercises. Aside from the ordering of material by date, students would find nothing unusual in this use of the blog. The instructor, however, finds that the use of blogging software makes this previously odious chore much simpler. Second, and often accompanying the first, instructors begin to link to Internet items that relate to their course. Mesa Community College's Rick Effland, for example, maintains a blog to pass along links and comments about topics in archaeology.15 Though Mesa's archaeology Web pages have been around since 1995, blogging allows Effland to write what are in essence short essays directed specifically toward his students. Effland's entries are not mere annotations of interesting links. They effectively model his approach and interest in archaeology for his students. The blogging tool is, at its heart, a form with two fields: title and entry-and the title field is optional. Learning Media Consultant Jay Cross captures the concept with his Bloggar tool. "Blog software comes with a personal Website for those who don't already have one. The software captures your words in dated entries, maintaining a chronological archive of prior entries. In the spirit of sharing inherent to Net culture, the software and the personal Websites are usually free. "21 What needs to be kept in mind here is that with respect to blogging tools, anything other than the entry field is a bell or whistle. Since the essence of the blog is found in individual, dated entries, the essence of the blogging tool is the entry field. Blogging software breaks down into two major categories: hosting services and installed applications. Hosting services. A hosting service is a Web site that will give you access to everything you need in order to create a blog. It will offer a form for you to input your entries, some tools that allow you to create a template for your blog, and access to some built-in accessories. Your blog is hosted on the hosting service (hence the name), and the URL will typically reflect the hosting service's URL. In a way, blogging hosting services are very similar to the services that allowed people to host their own Web sites (services such as GeoCities or Angelfire) or their own discussions (services such as Yahoo! Groups or ezboard). The best-known (and one of the earliest) hosting service is Blogger (http://www.blogger.com), founded by Pyra Labs. When the company was bought by Google early in 2003, it reporting having about 1.1 million users.22 The Blogger interface is not much more complicated than Jay Cross's Bloggar: the large field at the top allows you to submit an entry, while instructions and some options are provided in the lower pane (after you post, the help disappears, and you can view and edit your previous posts). Other major blog hosting services include GrokSoup, Salon Blogs, and TypePad. Major international hosting services include FarsiBlogs, for Iranian writers, and BlogsCN, for Chinese contributors. Installed Applications. A remotely installed application is a piece of software that you obtain from the provider and install on your own Web site. These systems are similar to Web-based applications such as ColdFusion or Hypermail. Because of this, the number of users is much lower, but those who do use them tend (arguably) to be more dedicated and more knowledgeable than those who use hosting services. Installed applications are also more suitable for institutional use, since access can be controlled. UserLand's software was used to launch a high-profile blogging experiment, Weblogs at Harvard Law, which was created when UserLand's founder, Dave Winer, became a Berkman Fellow. Arising from a conference in November 2002 called "What Is Harvard's Digital Identity?" it was intended, at least in part, to establish "intellectual community" among "the University' disparate schools and centers. "26 Launched in February 2003, it allows anyone with a harvard.edu e-mail address to create a weblog, and a hundred or so staff and students have done so, including Philip Greenspun, John Palfrey, and an anonymous blogger known only as "The Redhead." The students at Institut St-Joseph learned about the communicative power of blogs firsthand. "In the beginning, students anticipated the audience in a restricted circle," notes Principal Asselin. "According to the comments about their work, they realized that a lot of people could react and be part of the conversation. Each student received more than ten comments related to their posts. They had not fully realized that the entire world could read them. "31 Imagine the young students' surprise when, some time after posting a review of a circus on their blog, someone from the circus read the review and wrote back! Pilgrim's moving declaration should be read as a cautionary note. The warning is not about bosses who don't want employees to write weblogs (though that danger exists), but this: writing weblogs is not for everybody. In particular, if you feel no empathy, no twinge of recognition, on reading Pilgrim's words, then writing a weblog is probably not for you. This does not mean that you are not a part of the weblog world. It merely means that you participate in a different way. And herein lies the dilemma for educators. What happens when a free-flowing medium such as blogging interacts with the more restrictive domains of the educational system? What happens when the necessary rules and boundaries of the system are imposed on students who are writing blogs, when grades are assigned in order to get students to write at all, and when posts are monitored to ensure that they don't say the wrong things? It seems clear that although blogging can and does have a significant and worthwhile educational impact, this impact does not come automatically and does not come without risks. As many writers have noted, writing a weblog appears in the first instance to be a form of publishing, but as time goes by, blogging resembles more and more a conversation. And for a conversation to be successful, it must be given a purpose and it must remain, for the most part, unconstrained. Despite obvious appearances, blogging isn't really about writing at all; that's just the end point of the process, the outcome that occurs more or less naturally if everything else has been done right. Blogging is about, first, reading. But more important, it is about reading what is of interest to you: your culture, your community, your ideas. And it is about engaging with the content and with the authors of what you have read-reflecting, criticizing, questioning, reacting. If a student has nothing to blog about, it is not because he or she has nothing to write about or has a boring life. It is because the student has not yet stretched out to the larger world, has not yet learned to meaningfully engage in a community. For blogging in education to be a success, this first must be embraced and encouraged. From time to time, we read about the potential of online learning to bring learning into life, to engender workplace learning or lifelong learning. When Jay Cross and others say that 90 percent of our learning is informal, this is the sort of thing they mean: that the lessons we might expect to find in the classroom work their way, through alternative means, into our day-to-day activities. My thanks to the many educational bloggers who contributed to this article and without whom it could not have been completed: Will Richardson, Jeremy Hiebert, George Siemens, Todd Bingham, Rod Savoie, Mario Asselin, Mireille Guay, Dominic Ouellet-Tremblay, Florence Dassylva-Simard, Hugo De LarochelliÃ¨re, Jean-Philippe L. CÃ´tÃ©, and Rosalie Brochu, and to all the rest of my friends in the blogosphere-you know who you are. 1. Mario Asselin, "Weblogging at the Institut St-Joseph," Mario tout de go, September 1, 2003, <http://carnets.ixmedia.com/mario/archives/002425.html>. 2. Visit the Institut St-Joseph public spaces online at <http://cyberportfolio.ixmedia.com/carriere/> or <http://cyberportfolio.ixmedia.com/>. 3. Asselin, "Weblogging at the Institut St-Joseph." 4. Mario Asselin, e-mail to the author, March 25, 2004. 5. See Amanda Lenhart, John Horrigan, and Deborah Fallows, "Content Creation Online," Pew Internet & American Life Project, February 29, 2004, <http://www.pewinternet.org/pdfs/PIP_Content_Creation_Report.pdf>; and "Content Creation Online," Pew Internet & American Life Project press release, February 29, 2004, <http://www.pewinternet.org/PPF/r/77/press_release.asp>. 6. Will Richardson, "Blogging and RSS-The âWhat's It?' and âHow To' of Powerful New Web Tools for Educators," Information Today, January/February 2004, <http://www.infotoday.com/MMSchools/jan04/richardson.shtml>. 7. Bernie Dodge, "Birth of 28 New Bloggers," One-Trick CyberPony, January 20, 2004, <http://home.earthlink.net/~bdodge/blog/2004_01_18_archive.html#107466556022679878>, cited in the Educational Bloggers Network: <http://www.ebn.weblogger.com/>. 8. This short history and the quotation come from Rebecca Blood, "Weblogs: A History and Perspective," Rebecca's Pocket, September 7, 2000, <http://www.rebeccablood.net/essays/weblog_history.html>. 9. Charles Cooper, "When Blogging Came of Age," CNET News.com, September 21, 2001, <http://news.com.com/2010-1071-281560.html?legacy=cnet&tag=bt_bh>. 10. Jorn Barger, "Weblog Resources FAQ," Robot Wisdom, September 1999, <http://www.robotwisdom.com/weblogs/>. 11. Simon Firth, "Baring Your Soul to the Web," Salon, July 3, 1998, <http://archive.salon.com/21st/feature/1998/07/cov_03feature.html>. 12. Catherine Seipp, "Online Uprising," American Journalism Review, June 2002, <http://www.ajr.org/Article.asp?id=2555>. 14. Henry Farrell, "The Street Finds Its Own Use for Things," Crooked Timber, September 15, 2003, <http://www.crookedtimber.org/archives/000516.html>. 15. Rick Effland, "The Treasure Fleet of Zheng He," Rick Effland Blog, April 4, 2004, <http://apps.mc.maricopa.edu/blogs/asb222/reffland/archives/cat_something_to_share.html>. 16. Alexander Halavais, "Media Law" course website, February 17, 2004, <http://alex.halavais.net/courses/law/>. 17. Mireille Guay, e-mail to the author, March 26, 2004. 18. Farrell, "The Street Finds Its Own Uses." 19. Lane Dunlop, comment, Crooked Timber, September 18, 2003, <http://www.crookedtimber.org/archives/000516.html>. 20. Sebastian Fiedler, symposium leader, "Introducing Disruptive Technologies for Learning: Personal Webpublishing and Weblogs," Ed-Media Meeting, June 24, 2004, <http://static.cognitivearchitects.com/gems/Seblogging/EdMediaSymposium.pdf>. 21. Jay Cross, "Blogs," Learning Circuits, April 2002, <http://www.learningcircuits.org/2002/apr2002/ttools.htm>. 22. Dan Gillmor, "Google Buys Pyra: Blogging Goes Big-Time," SiliconValley.com, February 15, 2003, <http://weblog.siliconvalley.com/column/dangillmor/archives/000802.shtml>. 23. Todd Bingham, e-mail to the author, April 14, 2004. See also SÃ©bastien Paquet, "Weblogs Enter New Brunswick School," Seb's Open Research, April 16, 2004, <http://radio.weblogs.com/0110772/2004/04/16.html#a1539>. 24. Mena Trott, "It's About Time," Mena's Corner, May 13, 2004, Six Apart Web site, <http://www.sixapart.com/corner/archives/2004/05/its_about_time.shtml#>; Mark Pilgrim, "Freedom 0," Dive Into Mark, May 14, 2004, <http://diveintomark.org/archives/2004/05/14/freedom-0>; Mena Trott, "Announcing Pricing and Licensing Changes to Movable Type," Six Log, June 15, 2004, Six Apart Web site, <http://www.sixapart.com/log/2004/06/announcing_pric.shtml>. 25. "Radio UserLand v8.0.8," PC World, July 6, 2004, <http://www.pcworld.com/downloads/file_description/0,fid,22898,00.asp>. 26. Beth Potier, "Berkman Center Fellow Dave Winer Wants to Get Harvard Blogging," Harvard Gazette, April 17, 2003, <http://www.news.harvard.edu/gazette/2003/04.17/13-blogging.html>. 27. John Harvard's Journal, "Creating Community, On-line and Off," Harvard Magazine, vol. 106, no. 3 (January-February 2004), <http://www.harvard-magazine.com/on-line/010464.html>. 28. Lisa Kim Bach, "Internet Diaries: School Discipline Questioned," Las Vegas Review-Journal, November 10, 2003, <http://www.reviewjournal.com/lvrj_home/2003/Nov-10-Mon-2003/news/22546246.html>; "Miss. School Suspends Student for Calling Teacher âPerverted' in Online Journal," Student Press Law Center, January 29, 2004, <http://www.splc.org/newsflash.asp?id=736&year>. 29. Mario Asselin, quoting the student, e-mail to the author, March 25, 2004. 30. George Siemens, "The Art of Blogging-Part 1," elearnspace, December 1, 2002, <http://www.elearnspace.org/Articles/blogging_part_1.htm>. 31. Mario Asselin, e-mail to the author, March 25, 2004. 32. Mark Pilgrim, "Write," Dive Into Mark, October 1, 2001 (no longer extant); "The Weblog Manifesto," Talking Moose, September 29, 2001, <http://talkingmoose.manilasites.com/2001/09/29>. 33. Richard Long, "Back from San Antonio," 2River, March 28, 2004, <http://www.2river.org/blog/archives/000077.html>. 34. Will Richardson, "The Blogging in Schools Question," Weblogg-Ed, April 13, 2004, <http://www.weblogg-ed.com/2004/04/13#a1699>. 35. Matt, "Circle Limit II," Walky Talky, September 25, 2003, <http://walkytalky.net/archives/000062.html>. 36. Will Richardson, "Metablognition," Weblogg-Ed, April 27, 2004, <http://www.weblogg-ed.com/2004/04/27>. 37. Ken Smith, "CCCC Waves and Ripples," Weblogs in Higher Education, March 30, 2004, <http://www.mchron.net/site/edublog_comments.php?id=P2636_0_13_0>. 38. Will Richardson, "Reading and Blogging," Weblogg-Ed, March 31, 2004, <http://www.weblogg-ed.com/2004/03/31>; Smith, "CCCC Waves and Ripples." 39. Jeremy Hiebert, e-mail to the author, April 22, 2004. 40. Will Richardson, e-mail to the author, April 27, 2004. Views Today: 0 Total: 634. Last Updated: Aug 20, 2018 4:15 p.m.